The Faculty of Agricultural Technology of Widya Mandala Catholic University Surabaya added another one to their list of achievements in 2018. Previously, the Faculty of Agricultural Technology received an A accreditation which was decided and announced in Jakarta on March 20, 2018. This time, their journal, which is Journal of Food and Nutrition Technology (E-ISSN 2613909X), has been accredited by the Ministry of Research, Technology and Higher Education. This award was received directly by the Dean of Faculty of Agricultural Technology, Ir. Thomas Indarto Putut Suseno, MP., HDI. 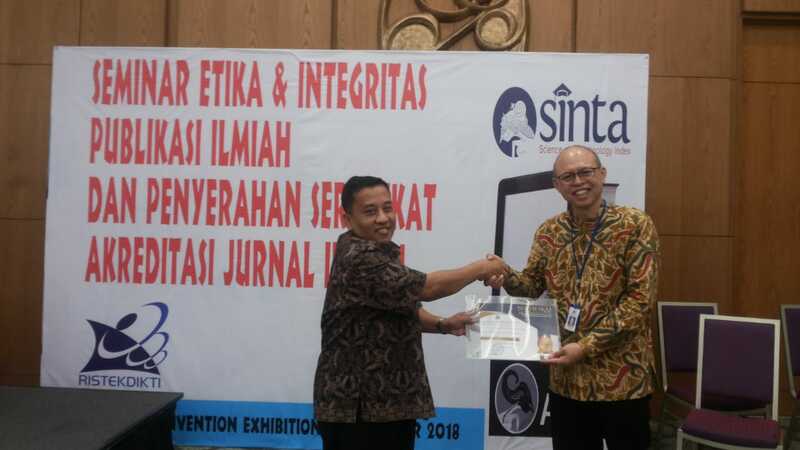 at the Indonesian Convention Exhibition (ICE) in Tangerang, during the Seminar on Ethics and Scientific Publication Integrity and the Submission of Certificate for the Scientific Journal Accreditation. This event was held and organized by the Ministry of Research, Technology and Higher Education. The award was given by the Director of Intellectual Property Management, Dr. Sadjuga, M.Sc.